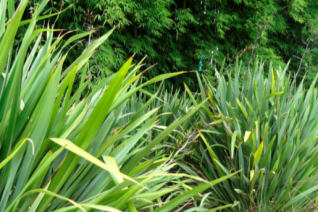 The most commonly seen New Zealand Flax in our climate and arguably one of the most hardy to cold. 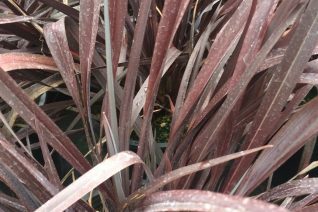 Deep maroon/purple evergreen foliage in a large clump to 5′ x 5′ ultimately in a hot position and full sun in rich, well drained soil. Regular summer water increases the growth rate which in turn establishes the plant more thoroughly. The more established the Flax the more vigorously it returns if it gets hit by cold. If it does, try not to cut the whole thing to the ground but leave as many viable leaves as possible for food to aid in the recovery. Great plant for hot hellstrips and containers. Borders. etc. Following mild winters (above 20ºF) it may send up 6′ spikes with duckbill shaped yellow flowers in summer. Thrives at the Oregon Coast where it seldom is ever bothered by cold and where it absorbs blasting salt laden winds happily. High deer resistance. We selected this incredibly dark foliaged New Zealand Flax from a huge seed batch. It was the darkest maroon/black and exhibited great vigor. To 3′ x 3′ in rich, well drained soil with light but consistent summer moisture. Soak once every two weeks once established. Full sun to light shade in a somewhat protected location. When established it is capable of freezing back in extreme winters and recovering fully by early summer. Following mild winters (above 20ºF) 6′ spikes may appear with tubular yellow flowers on a much branched inflorescence. If in containers move to a freeze free location in the event of an arctic blast (about once every four years). Arching stems are graceful. High deer resistance. Great performance on the Oregon Coast. Evergreen. 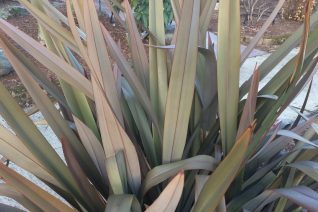 Aka Phormium colensoi, Mountain Flax has a different habit than the more commonly seen and very upright Phormium tenax. This large clump forming plant has wide and DROOPING sea green foliage. It rises to about 4′ tall but spreads at least 7′ in time. Evergreen perennial for borders, containers, This inland species is said to be hardier to cold than P. tenax or its hybrids.. So far we have not observed that. It seems to be the same hardiness about 12ºF but will regrow if frozen to the ground. Rich, well drained, moisture retentive soil is ideal with regular summer irrigation- which spurs establishment and luster. Following mild winters (above 20ºF) 8′ spikes deliver yellow duck beak flowers on a stately and angular inflorescence. If frozen back by temperatures below 17ºF established plants are capable of recovering quickly and entirely by early summer. Excellent performance at the Oregon Coast where it tolerates gale force salty winds and will never be injured by severe cold. Give it a protected spot in the Willamette Valley and shield it from subfreezing wind during arctic events. Very pretty evergreen perennial. High deer resistance. New Zealand mountains. Picture taken on the Oregon Coast.